If you want to find patents where the earliest member of the patent's simple family is from a certain country, use the PRICN field code. This is a funny little field, but it can be useful when you need it. And we have it, so feel free to use it. This says of all the granted patents in 2013, which have priorities from countries other than the US? Would you believe that more than a third of US grants in 2013 have priorities from previously filed non-US applications. It just goes to show you how truly global the patent system is! Open up the document details, then the Family Tab (1). 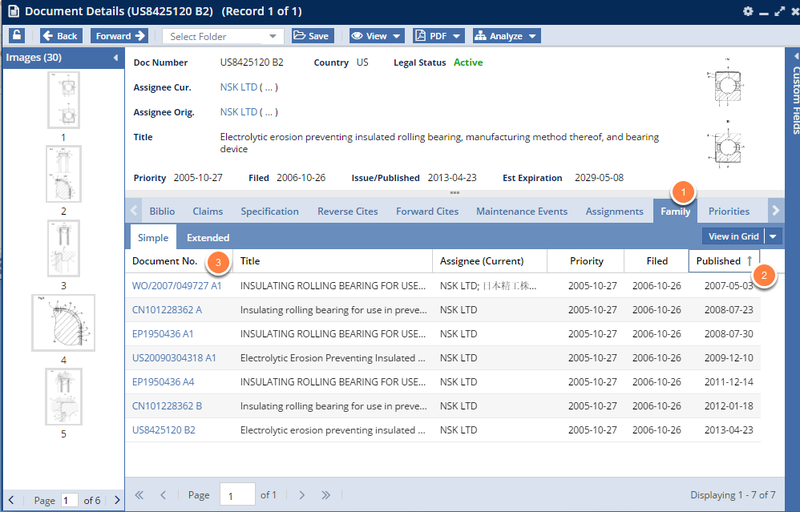 Sort the Published (date) column (2) and view the earliest priority document number (3). Notice in this example it is a WO (PCT application) document. ISD:2013 NOT PRICN:US --> Finds documents granted in 2013 where the priority (first) document is NOT from the US. PRICN:CN --> Finds documents whose original priority is China.